Sea Snake Sightings or Worm Eels? | Marine Life Society of South Australia Inc.
Sea Snake Sightings or Worm Eels? “Hi David, a local resident came into the centre today asking about a ‘snake’ that she found on the beach at Normanville South. She found it being washed up, it was about 30 cm long and a bit thicker than her finger with a yellow head and a pale whitish/pinkish body. She said she picked it up and put it back in the water where it swam off with its head out of the water. She is not sure if it is a snake, but said it looked like one. Any ideas? I’m aware you’ve had 15mm (+/-) rain at Normanville in last few days . . . . so there’s some chance it’s a true land snake such as a juvenile red-bellied black that got washed into the sea, and as they are good swimmers in context of terrestrial Aussie snakes perhaps it preferred staying in shallows till (with tidal help??) it chanced upon a safer beach/dunes/ideally estuarine exit point with less predation risk as it desperately tries to find cover after slithering up an open white sandy beach. More likely, I think, . . . . that it was a distressed/weakened short-headed worm-eel which is a true marine eel, common, but not often seen by fishers though also known to them as knot-tying eel (does itself into real knots if caught on hook at night) but if it was this critter the head out of water pose would be from ailment, not a normal behaviour. After I swam over it, it had a go at my leg. That took me by surprise, I can tell you! Wide mouth like a bottom-dwelling fish. I have searched the Net and found nothing like it – certainly, nothing like it in SA. They also tend to have noses. This one had nothing like this. Can you offer any thoughts on what this creature might be? “Hi Tim, a sea snake would have obvious scales. An eel probably wouldn’t. of course, excellent swimmers and divers, feeding on fish and eels. colubrina), which comes ashore to lay its eggs. or grey nurse shark here either. I would have thought of an eel perhaps, except for the leg biting bit. 3253-sea-snakes which compares worm eels with sea snakes. which sweeps down the eastern coast from the warm waters of the Great Barrier Reef. this ID as ‘almost a certainty’. to be a declining species here, purely anecdotally, and possibly even ‘in peril’). obviously I can’t be certain, and do you have an UW camera?! and Elliston. I’ve never taken any pics of the very few southern congers I saw . . .!! also, just much less often. “Thank you so much for your timely and very helpful responses. Conger. The head wasn’t sufficiently long and sharp for it to be a Serpent Eel. was a much darker green than I’ve seen in pictures and I could see no fin along its back. The yellow stripe was quite distinctive. from MLSSA who responded in such a timely and helpful manner. Our February 2013 newsletter (No.398) included a follow up article titled “More on “Sea Snakes in SA”. It explained that the very same month that our November 2012 newsletter discussed the suggestion of sea snake sightings in South Australia, there was an Advertiser report about a sea snake capture at Brighton jetty in SA. A snake fished from the water at Brighton Jetty last night was probably a Yellow-bellied sea snake – a specimen 10 times more venomous than a King Brown, an expert says. The snake was caught by Panorama man Bob Ridge, who had been fishing for whiting, about 9.15pm, drawing a crowd of onlookers. Mr Ridge, 61, said the snake appeared to be “more than a metre long” and was the last thing he expected to land after feeling a niggle on his line. Australian Venom Research Unit director Dr Ken Winkel said he thought the sea snake caught by Mr Ridge was probably a Yellow-bellied sea snake. “Yellow-bellied sea snakes are not very common but they do occur in SA and Victorian waters,” Dr Winkel said. 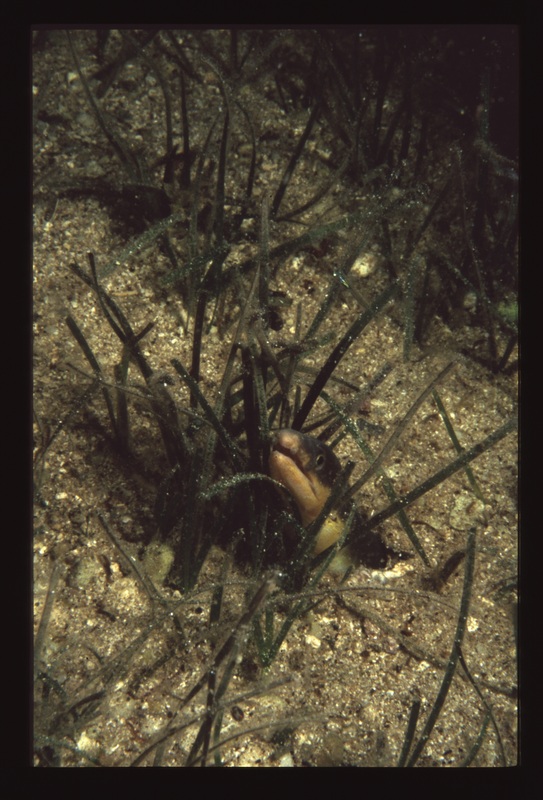 The sea snakes were very distinct in the colouration and had a paddle-shaped tail. He said it would be very unusual for a tropical sea snake to be found here. Yellow –bellies were mainly found off-shore and rarely sighted close to shore or caught from jetties, he said. Dr Winkel said it was very rare to be bitten by a Yellow-bellied sea snake but its bite was lethal. “The (venom) is more toxic than a King Brown snake. While it was very uncommon for Yellow-bellied sea snakes to cause trouble, there was a risk of getting poisoned, he said. “Sea snake venom contains toxins that affect the nerves,” Dr Winkel said. May I comment briefly on sea snakes in SA waters? I’m sure Dr Winkel is right in stating true sea snakes occasionally enter SA waters. But the creature hooked off Brighton Jetty by Bob Ridge at night will certainly have been one of our several larger eel species, not a reptile. Our eels (e.g. the shortheaded worm eel) can look remarkably similar to sea snakes, are common night bottom feeders in SA’s inshore waters, and unlike sea snakes have mouths large enough to take a hook. However, I write this mainly to remind all fishers of a seemingly obvious but very important ’take-home message’: Bob’s discretion in cutting the eel free was the only sensible response where there is even slight uncertainty re the correct identification of any and all possibly dangerous hooked critters. The eels to which I refer can still give a nasty bite, and for several species there exist reliable records of aggressive behaviour towards recreational SCUBA divers who inadvertently disturb them. Because we know so little about our local marine life(except the tiny percentage of species targeted by commercial and recreational fishers alike) the incidence of similarly risky ‘dodgy hook-ups’ faced by fishers in SA is actually surprisingly high, in my largely anecdotal experience over 5 decades in this my home state. I first wrote about short-headed worm eels in our February 1983 newsletter (No.69). I had been diving at the Screwpile Jetty at Granite Island, Victor Harbor in November 1982 when I came across one. It was over 400mm long. I had difficulty netting it for my aquarium. It always managed to slip away with a little help from the silty sea bed which was easily stirred up. A fisherman on the jetty ended up catching the eel on his hook and line. It had taken his squid bait and swallowed the hook. The eel tied itself up in a tight knot around the line. The fisherman wanted me to help him to take it off of the hook which was protruding through the side of the eel’s mouth. We very carefully untangled the eel and reluctantly cut the eye of the hook off. The eel swallowed the hook before we could pull it through the side of its mouth. I took the eel home to see if it would survive in my aquarium after swallowing the hook. I hardly ever saw it in the aquarium though. I even went nine weeks without seeing it at all, so I thought that it had died. One night I saw the eel swimming about at the front of the aquarium glass (whilst the aquarium light was off). I deduced that the eel was a nocturnal feeder and that it would only come out from under the rocks when the house was in total darkness. I wrote at the time that according to “The Marine and Freshwater Fishes of South Australia”, short-headed worm eels grow to a length of 560mm and are quite common in South Australia. They are frequently mistaken for sea snakes (which I stated dis not occur in SA waters, only in tropical waters). I later found out that the eel was burying itself in the gravel bottom in the aquarium. It would only come out during darkness at first but, after some 11 weeks or more, it would come out whenever there was some food placed in the aquarium. It survived for almost one year and grew an extra 5omm, reaching about 460mm in length. We grew quite fond of the eel and we were upset to find it dead on our lounge room floor one day. It had apparently managed to jump out of the aquarium through a gap in the cover glass whilst we had a protein skimmer operating. Back then, I referred to short-headed worm eels as having the scientific name of Muraenichthys breviceps. This has now changed to Scolecenchelys breviceps. According to the web page found at http://www.themercury.com.au/lifestyle/warmer-waters-makes-tassie-a-hotspot-for-new-fishy-friends/news-story/b8e42dbad2c1231e273782e6f75eeac5 , two venomous yellow-bellied sea snakes have been discovered on the east coast of Tasmania, having made a marathon swim from their usual range in tropical northern waters.